Congrats on 600 Followers! And best of luck with your busy schedule! I love seeing everything you listed on a blog. I'm all about pretty swatches, awesome nail art, and comparisons/dupes. Tutorials are pretty good too. Honestly, anything to do with polish makes me smile. Congrats on your milestone!!! Thank you for this awesome giveaway!! I really like nail art and comparisons. I love swatches and comparisons! I really enjoy seeing comparisons and dupes; not only does it help me choose in a 'one or the other' type of category, but it's always very interesting to see the difference between in the bottle and on the nail. I like swatches and comparisons. Awesome giveaway! Thanks!! I love swatches, nail art, and hauls. Comparisons are always nice, too! Great giveaway! I love to see nail art. Congrats on 600 followers. I love seeing your nail art/stamping (since that is something I don't do)! Congratulations. It is always fun to know that people read what you are writing and enjoy your blog photos. 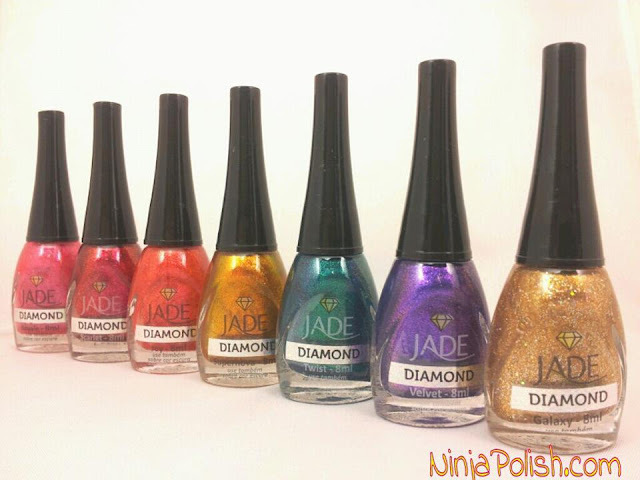 cool nail polish give away! Congrats on the 600 followers! :) i would love to see tutorials and more nail art :) those are always fun. All four of your examples! comparisons, nail art, swatches, and tutorials! I would love to see nail art. Swatches and nail art! I love to ogle pretty pictures! LOL! Congrats and thank you! I love a nice mix of everything, I of course LOVE some great nail art the most, but I like to see swoon-worthy swatches also. OMG you pic's on your page are so freaking cute!!!! I love nail art tutorials! Congrats on the milestone! To answer you ??? I like nail art idea's =D love your cat and the hat!!! Great Giveaway!! I love to see a wide variety of things, keeps it interesting!!! Thank you for the giveaway!! I love to see water marble designs!! Congratulations on hitting the big six. What a great way to share your joy with us. How awesome would it be to win these beauties. Congratulations and thank you for the giveaway! I love seeing swatches, comparisons, and nail art. I love looking at nail art tutorials! I love nail art and swatches. Also, retro polishes are great too! I love Jade polish! !Thank you! I like all of them! It mixes it up a bit. I like nail art the most though because I use them as inspiration! I always enjoy the swatches, congratulations !! Wow. I could only dream of 600 followers. Congrats! :) And I love seeing nail art and tutorials. I echo all the ladies that like tutorials. As a beginner, I love having someone show me the way! You chose a gorgeous prize--thank you! I definitely prefer the tutorials and comparison/dupe posts! Congratulations on your 600 followers. I like both swatches and nail art, but also comparison and haul posts. I enjoy seeing swatches and reading nail products reviews, but comparison posts are just as useful if not more when it comes to LE or HTF polishes, or brands unavailable in my country. I like your blog and nail art. Beautiful designs on nails. I love to see swatches and comparison posts. Nail art is fun to see once in a while. Thanks for a great giveaway! I always enjoy seeing nailart. Congrats and thank you for this awesome giveaway. I like a little bit of all on a nail blog. But most of al all I like nail art. Most of all I like nail art and tutorials on blogs :). Congrats on the many well deserved followers! Congratulations to 600 readers! This is awsome! Your nail art (especially nail art challenges) are my favorite! Congrats on your 600 ! I love to see art! I prefer swatches, comparisons and I also like display posts. Awesome giveaway!! I love to see swatches! It's so cute, all the nail arts! Swatches and dupes/comparisons! Awesome giveaway! Definitely nail art, especially stamping! I love to see strong base colours with glitter on top! Congrats and thank you for the giveaway! I love seeing comparisons/dupes. Congrats! I am a new follower :) I love swatches! I like swatches of new polishes & comparisons/dupes. I'm new to your site but I really like what I'm seeing so far. Congrats! Congratulation with the 600 followers! I love seeing comparison/dupe posts. I would like to see more articles about dupes. I love seeing comparisons! Thank you so much for this giveaway! And congratulations on 600 followers! I am ~pretty sure~ I am one, but GFC hasn't been working for me for about a month, but I DO follow you on Bloglovin'. And now I have logged in to GFC with my Google login, and followed that way! So I know for certain that I am following you by GFC also. BTW-that Wise Man mani is absolutely gorgeous! I love seeing swatches and tutorials, thanks! Congrats! And hope you get a rest, you sound soo busy! Congratulations! I like to see swatches and dupes the most! Congrats and thanks for the giveaway! I like seeing swatches. I like seeing swatches and comparisons. swatches and creative nail art! I like swatches and comparisons. I love seeing swatches and comparisons. I also like finding out where to get polishes besides online. Congratulations! I always love swatches and reviews. I like to see photos of a clean mani & the polish indoors, outdoors, comments on formula, comments on any similar shades, if it's a polish that requires a base layer/undies, one shot without the undies, and honest review from the blog host. :-) - Jen Z.
I love seeing swatches and nail art. Congratulations on 600+! Nailart and swatches!! !Thanks for the giveaway-these babies are awesome!!! I like seeing swatches and comparisons.. oh yes, and giveawaysv:) thanks for this awesome one! Congrats!!!! Lately I've been into nail art tutorials, and swatches are always helpful & fun. Thank you for this giveaway!! Thanks so much for your work, and giveaways! I love anything bright and colorful! I like to see swatches and also love to see comparisons/dupes! Swatch pictures are the best. I like tutorials and dupe/comparison posts. i love seeing nail art and tutorials! Nail art!! I love your designs!!! I'd love more nail art tutorials! I like seeing nail art and new techniques. Of course I love to see swatches but I really enjoy seeing fun nail art and instructions on how I can do it myself!! I'd love to see more tutorials :) Thank you for this giveaway! I love tutorials on nail art!!! Thanks for the awesome giveaway!!! I like comparisons and dupes, I never keep them in mind and I always end up with 2 or 3 polishes that look almost exactly alike! My absolute favorite posts are nail art and tutorials, but I also like to see swatchces, for the informative value. I love seeing nail art and tutorials. i would love to see more nail art and tutorials. I like nail art and swatches! I love comparison/dupe posts the most! Congrats on reaching 600 followers & thanks for the rad giveaway! I love to see swatches, comparisons and tutorials on a nail blog. Congrats your followers and thanks for the giveaway! Tutorials & nail art are my favorite! Congrats on 600 followers - I see the number's almost up to 700 now! I love comparison posts and tutorials. Well, and nail art, I can't decide! Of course, you always have the best art!! I love comparisons and tutorials! New nail art is my fave! I definitely love to see the creative side so nail art posts but also like comparisons between 'high end' and drugstore products in the same colour. I like nail art and swatches. Love tutorials and swatches, personally! I love comparisons and dupes. What a great giveaway! I really like comparisons and nail art. I like to see tutorials and dupe alerts. Congrats! I really love seeing nail art, and its even better with a simple little tutorial! What a great giveaway! Thanks! I just became a follower and I love what I've seen! I often follow nail blogs to see swatches, but I love to see a little bit of everything. Nail art and comparison posts are among my favorites! i'm a new follower!! i love posts where i can see dupes!! I like to see on a nail blog swatches and nail art.